Today’s pedal line is from Mike Rubicz. If you have a pedal line (doesn’t have to be in a board) for your rig, please email me a photo, bio, description of pedals and routing to pedalline@nulleffectsbay.com. Every Friday I’ll showcase a pedal line submission. Make sure you include any links to your band or music page. I love reading the posts on effectsbay and figured I’d toss a pic and a paragraph of the pedals i use to achieve the tone I love. Thanks for doin what you do so well! 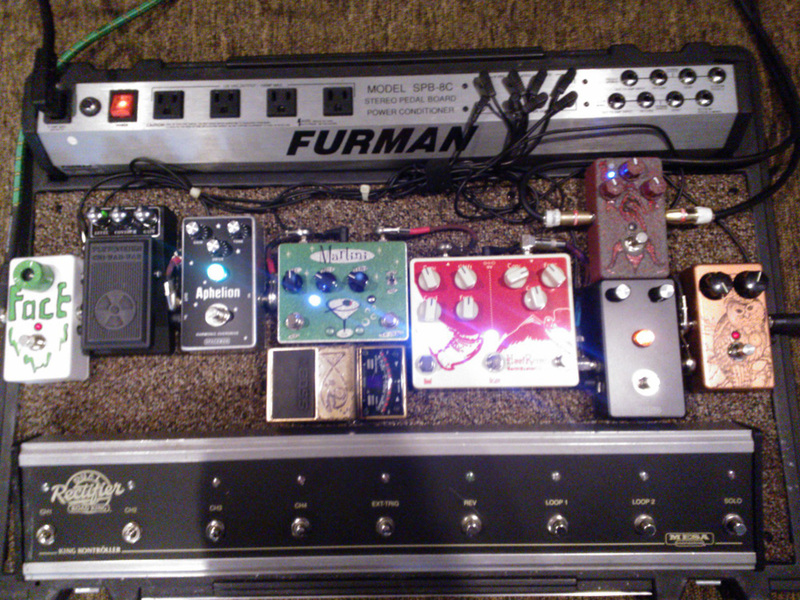 I love my Furman SPB8C power conditioning pedal board first off. It makes it very easy to keep things nice and clean and also provides clean power to anyone needing to plug into it due to lack of stage power (we all know what that can be like). The #1 pedal in line is the MXR BLUE BOX with C11 snipped for a little more output. I gave it a copper paint job and a steampunk owl graphic. #2 is the SPACEMAN EFFECTS SECRET MISSION BOOST/DRIVE. Great boost AND drive in one. Killer build quality too. #3 EARTHQUAKER DEVICES HOOF REAPER. I really dig the versatility and build quality of this pedal. Very meaty on the Hoof side, and classic tone bender on the reaper side. The octave up sounds great with neck pickup and above the 12th fret. #4 TORTUGA EFFECTS MARTINI CHORUS/VIBE. Another extraordinary, quality build and tone. #5 SPACEMAN EFFECTS APHELION. I use this pedal pretty frequently for great lower gain/gritty lead type tones. Really neat pedal that lives up to the hype! #6 PLUTONEIUM CHI WAH WAH. I love this pedal because of the small footprint and build quality. I don’t use wah alot, but when it’s time comes, i love the vintage style sweep this wah provides. #7 MXR PHASE 90 BLOCK WITH R28(?) snipped for a smoother tone. I repainted it and dubbed it the MNR FacE PHASER. #8 is a BOSS TU-2 that I have just hangin out not plugged into the chain, just in case anything goes bad with my Snark SN-8 tuners. Again, custom gold paint with the dubbed name Crazy Tuner Fish. #9 Also, i run the MXR CARBON COPY DELAY through the loop of my Mesa Road King V1. I have gotten GAS to get another delay, but can never bring myself to do it because this pedal is so great. I repainted this one too. I just can’t stop messin with stuff:) The big 9 button Behemoth is the “King Kontroller” for the Road King amp. I play a couple of sweet PRS NF3s’ and have the pedals running with evidence audio monorail cables that i made from a kit. Rock out, and Roll on!